When cheerleading got its start in the 1890s, all cheerleaders were men; in fact, it wasn't until World War II that women joined the ranks. Over the years, cheerleading has evolved from collegiate men yelling into a bullhorn to a vast group—ranging from kids as young as five learning basic cheers, to professional squads choreographed by famous dancers. Whether your child is a beginner or an experienced "lifter" or "flyer," there are ways to minimize injuries in cheerleading. There is no sport that doesn't benefit from warm and flexible muscles, and for cheerleaders, it's crucial. Stretching for increased flexibility can be done every day for about ten minutes and a good warm-up that begins with dynamic movements like jumping jacks and ends with static stretches (no bouncing!) is an absolute must before practicing or performing. Always stretch afterwards, too. The body's core, including the abdomen, back and hips, is involved in all cheerleading moves. A strong core will minimize injuries and maximize arm and leg strength. Great core exercises include planks, pushups, Pilates, yoga and swimming. A strong core isn't just great for cheerleading. It makes for easier breathing and straighter posture, too. Because uniformity is important in cheerleading, teaching proper form is a priority. But learning moves correctly isn't only for great looking cheers; strong form will also prevent injuries. The most vulnerable parts of the body include the back, wrists, elbows, knees and ankles, which can be damaged with repetitive movements. Teaching proper landing form is especially important. Most cheerleading injuries happen during practice, with sprains and strains being the most common. Signs of overuse include pain or swelling that begins sporadically and becomes more frequent. Often, rest and basic first aid can alleviate these minor injuries and prevent them from becoming something more serious. Skill progression is exciting and fun, but if done too quickly it can be dangerous. Mats should be used for any new jumping or throwing skill and clear communication needs to be utilized by coaches and athletes to ensure everyone is ready to tackle the new task. 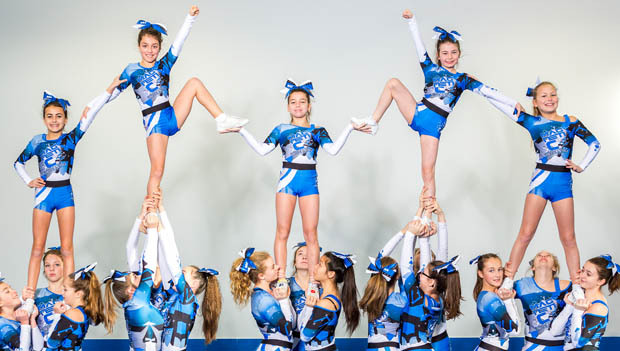 At very young ages, cheerleading coaches may simply be a parent willing to take on the job. Even then, they should be trained in CPR and first aid. For older, more skilled kids, coaches should have completed a training that teaches building safe programs and assessing risk. Loss of only two percent of body weight through sweating can impact performance and dehydration can lead to headaches and fatigue. An unfocused athlete is more prone to injuries, so staying hydrated is critical. A water bottle should be on-hand at all practices and performances and water should be consumed 30 minutes prior to the activity. Sports drinks are fine for activities lasting more than an hour and a half. Find cheerleading camps and clinics near you.